Long Story Short. It's simple, affordable, well-designed yet still more than just a hostel. When it comes to our staff, it's very relaxed, laid back and have very high standards. Our old fortress is culturally and historically rich, meaning great photos and stories are made here and you can take a seat in our magical garden or gradient terraces overlooking the petanque pit. Parking available as well. 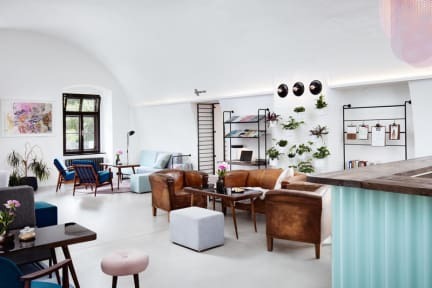 Located in the historical centre of Olomouc, Long Story Short is for anyone who is looking for a break from the ordinary. We are in a unique building in a perfect location near the heart of the city. The Gothic Cathedral is one of the oldest and most striking monuments here in Olomouc. You'd probably never expect the second tallest church tower in the country by walking up a small street. The scale of this cathedral might surprise you, but it's been around for over 1000 years. It is the most important cathedral in Moravia and its appearance is perfectly in line with its significance. It has a richly decorated interior and its crypt is the final resting place for the bishops and archbishops of Olomouc. Not only there is the Gothic Cathedral, but many more sights worth seeing, as for example The Holy Trinity Column, which is listed as a Unesco sight. Only by walking through our city centre, you can stumble upon an astronomical clock, several churches along with towers offering beautiful view of Olomouc. Here you will find a unique mix of dorms and private rooms for up to 56 people. We have an in-house café & bar, meeting room, free WiFi and more. There is also a shared lounge at the property where you can chat with other fellow travelers. Guests can enjoy our summer garden seating and onsite café, as well as live music events. Buffet breakfast available with only organic and local produce being served. Free private parking is available on site. Reception time 7:00 to 23:00 - Night guard on site for late check ins.